On Tuesday, Zimbabwe’s parliament was in session listening to speaker after speaker tell why president Robert Mugabe should be impeached and removed from office. Observers were claiming that the impeachment process would be completed within two days. The honorable Jacob Mudenda, notice of resignation as President of the Republic of Zimbabwe in terms of the provisions of Section 96 (1) of the Constitution of Zimbabwe (Amendment Number 20), 2013. Following my verbal communication with the Speaker of the National Assembly Advocate Jacob Mudenda at 13:53 hours, 21st November, 2017 intimating my intention to resign as the President of the Republic of Zimbabwe, I Robert Gabriel Mugabe in terms of section 96 (1) of the Constitution of Zimbabwe hereby formally tender my resignation as the President of the Republic of Zimbabwe with immediate effect. My decision to resign is voluntary from my heart and arises for my concern for the people of Zimbabwe and my desire for the smooth, peaceful and non-violent transfer of power that underpins national security, peace and stability. Kindly give public notice of my resignation as soon as possible as required by section 96 (1) of the Constitution of Zimbabwe. When he read the word “notice of resignation,” there was wild cheering, the thumping of tables, dancing, and singing. Mugabe had been Zimbabwe’s dictator for 37 years, but now the age of Robert Mugabe was finally over. 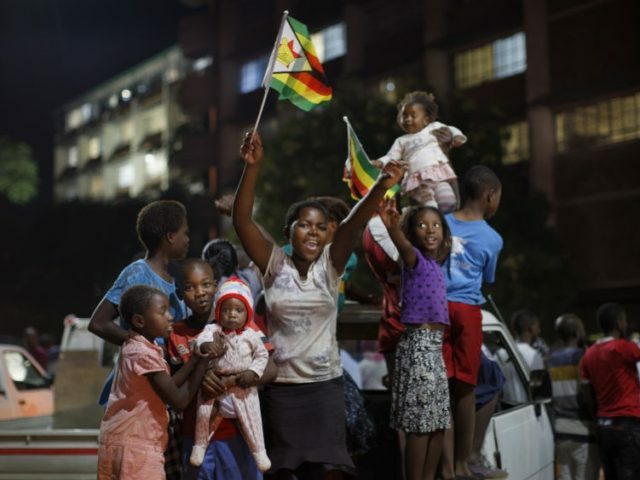 The euphoric celebrations quickly spread into the streets of the capital city Harare, when thousands of Zimbabweans flooding the streets, dancing and singing. There are a number of unanswered questions about Robert Mugabe’s resignation. Did Mugabe really switch speeches at the last minute on Sunday just before his nationalized televised speech, double-crossing the army? Then, why did he suddenly resign on Tuesday? The people have spoken. The voice of the people is the voice of God. Today we are witnessing the beginning of a new and unfolding democracy. I have also communicated with the South African and Namibian Presidents as well as Former Tanzanian President Mr Jakaya Kikwete and they have applauded Zimbabweans for the peaceful manner and conduct during the operation. People want food, security and jobs. We need to work together to ensure we deliver. I dedicate myself to be your servant. Many Zimbabweans, as well as many observers, were thrilled to hear this skilled politician of many decades make promises of food, security, jobs, and a new democracy, but others were skeptical. Although Mugabe recently fired Mnangagwa as vice-president, triggering the current crisis that led to Mugabe’s downfall, the two men nonetheless worked closely together since independence in 1981. They are both in the Shona tribe, and they both are responsible for Operation Gukurahundi, the genocidal war crime that brought in North Korean soldiers to help exterminate tens of thousands of civilians in the hated Ndebele tribe. They have both cooperated in turning Zimbabwe into a police state, where anyone who speaks against the government is likely to be arrested, tortured and killed. This is particularly true of the members of the Ndebele tribe that managed to survive Operation Gukurahundi. They both worked together on Mugabe’s “indigenization” program, which threw out farm and business owners who knew how to run a farm or a business, and replaced them with thugs and cronies from Mugabe’s and Mnangagwa’s Shona tribe who did not know how to run a farm or business. Over three decades, Mugabe and Mnangagwa turned Rhodesia, which was a wealthy country and the breadbasket of southern Africa, into today’s Zimbabwe, which is an economic basket case. This transformation from breadbasket to basket case is very apparent to the people of Zimbabwe, and along with the sudden appearance of political freed is why the people are euphoric that Mugabe is gone. However, others point out that Mnangagwa is no different than Mugabe, and will pursue the same brutal policies. This was already signaled on Wednesday when Mnangagwa gave his speech. He could have given it at a neutral venue, so that all segments of Zimbabwe society could attend. Dogs can keep on barking and barking, while the train that is Zanu-pf continues to rule. This is the kind of language that Robert Mugabe used regularly, and Zimbabweans in the Ndebele tribe see this statement as a signal that Mnangagwa is going to be as violent towards the Ndebeles as ever.